• Charger, Boost up & Quick charge run-down battery as well as provide normal charging for 2 batteries. 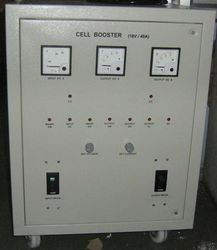 Manufacturer of Cell Boosters & Battery Chargers. Our product range also comprises of Battery Chargers, Data Acquisition Systems and SMPS Power Supplies & Battery Charger. - Jumper cables are used to start a vehicle with a dead battery. - The jumper cables are attached to the dead battery and a fully charged battery in another vehicle. - Once the vehicle with the dead battery is started, drive the vehicle to charge the dead battery. - Great for truck and cars. Sulphation of plates and terminals is a major problem with Lead Acid Batteries used in Inverters and Vehicales. Using our de-sulphating Battery Booster circuit, the working life of a Lead Acid Battery can be increased from 2 years to 6 years, with dramatic improvement in the output (Ampe re-Hours). Easy to read battery status LEDs tell user percentage of battery life. Battery Booster Attach with your existing Inverter, Vehicle, or Automotive battery. Your battery will work two To three Times more. It will increase the battery backup, and in very less time it will charge your battery and save electricity. Battery performance will become double.